All star cupcakes truly earn their title and it’s not just because there is a star on top. These cupcakes are delish! They are moist and full of flavor. 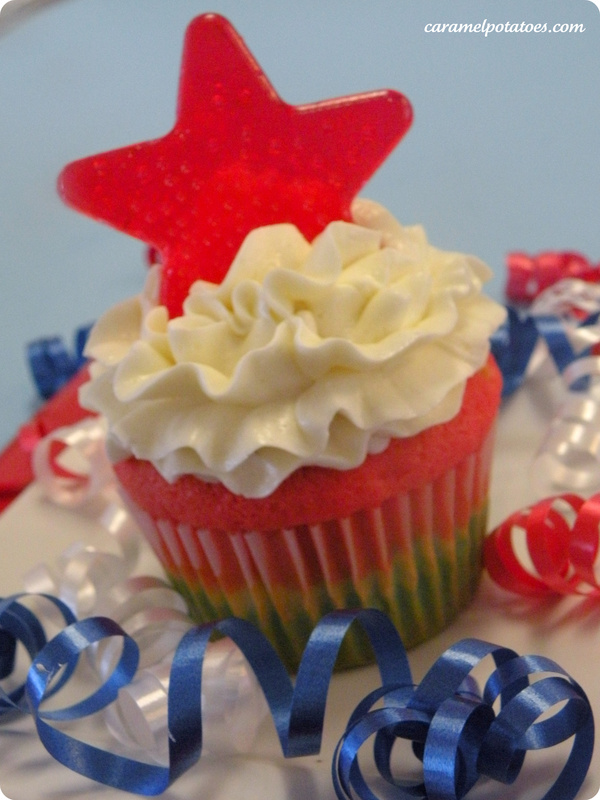 These particular cupcakes are red, white and blue for the 4th of July, but they are easy to make any color. They are great for sports teams or school events. You of course can make them with no coloring or with all the colors of the rainbow. It is all up to you. So the next time you are asked to bring cupcakes-impress a crowd with these. Preheat oven to 350 and place cupcake wrappers in your pan. 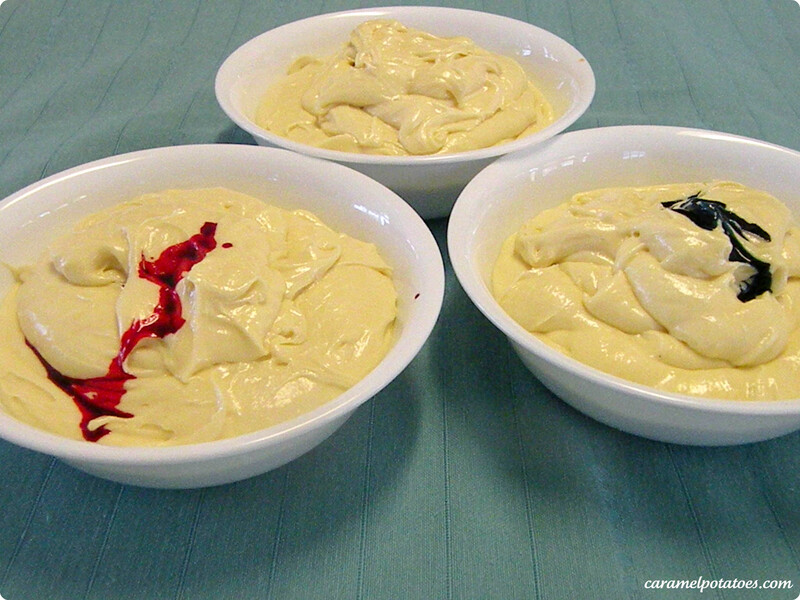 Add all ingredients to a large mixing bowl and mix on med-high speed until no lumps remain in batter. Depending how many colors you are wanting to use divide your batter into separate bowls. I used three colors for the 4th of July cupcakes, so I had three different bowls. Add food coloring to each of your bowls. Obviously, for the white layer I didn’t add any food coloring. Now you are going to want to have all your colored batters ready, your cupcake pan ready, and a small bowl of water. 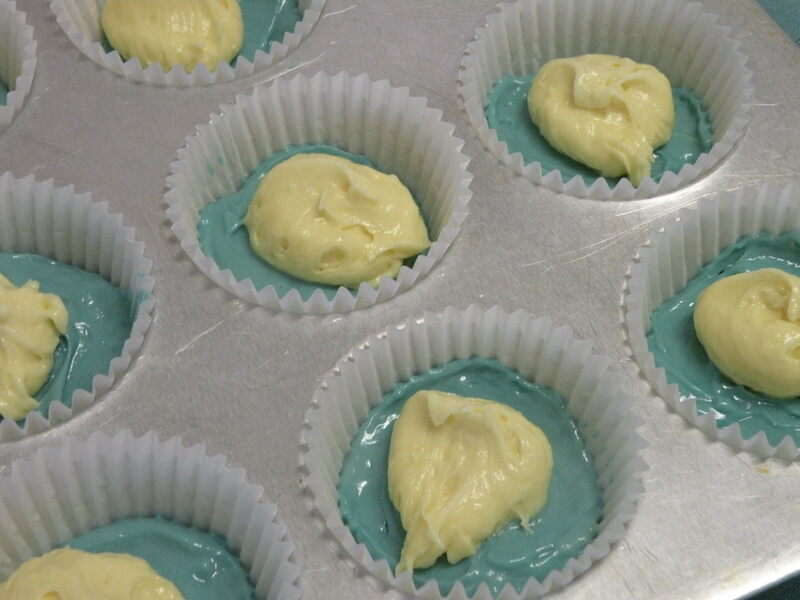 Decide what color you want to be your bottom layer and place a spoonful of batter into each tin. Depending on how many colors you are using depends how much batter to use. I was using only three colors for this one so I did a pretty big spoonful. 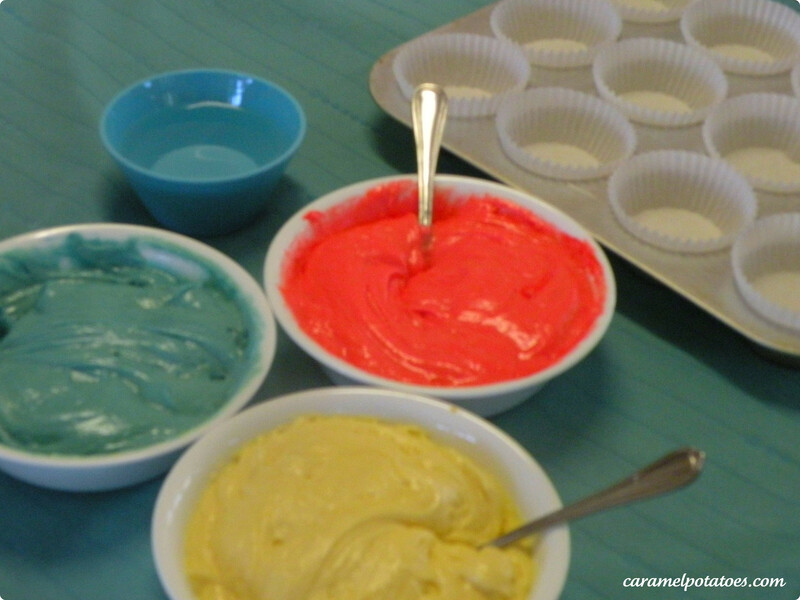 If you are using more colors you will need less batter of each color. 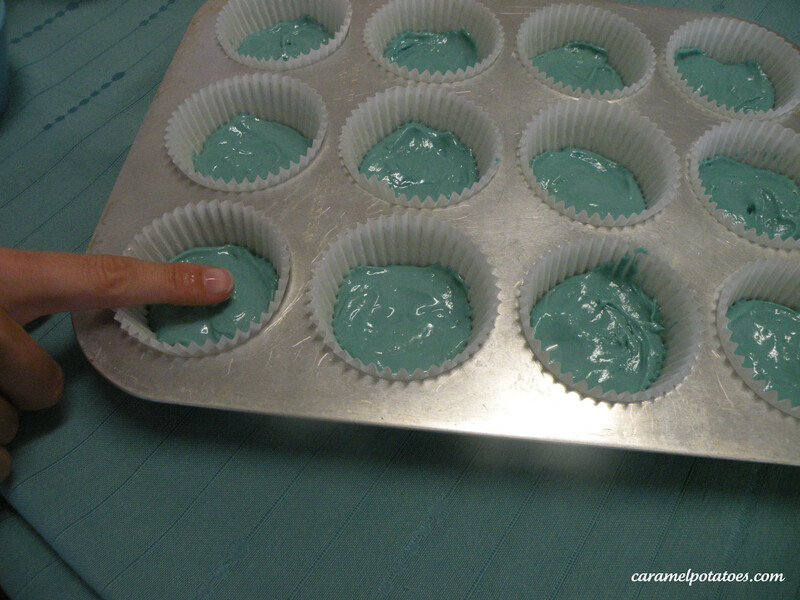 After spooning in your first layer you are going to need to spread it evenly across the entire bottom of the cupcake liner. The easiest way to do this is to dip your finger into your bowl of water and use your finger to spread the cake batter until even. You will probably need to get your finger wet for each cupcake. And continue on until all of your colors are completed. Each layer you will spoon in the cake batter and smooth with your finger that was dipped into the water. Once all your layers have been add place in the oven and bake for 20-25 minutes. To know for sure if they are done; insert a toothpick into the center of one cupcake and if it comes out clean you know they are done. What is that star that is the topper for the cupcake? The star on top is hard candy melted in a star mold. I have planned a tutorial for how to do this. Look for it in the next week or two. Thanks for the reminder! !